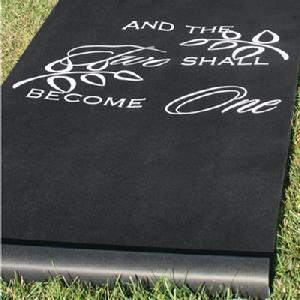 30046 - Black, durable rayon aisle runner with “And The Two Shall Become One” and leaf design printed in white. 36" x 100'. Pull cord included. Design printed 8' from beginning of runner. Wording faces the entrance. Adhesive strip at top of runner secures to surface.